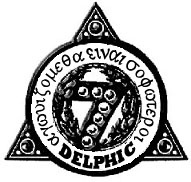 We have added another Notable Delphic Alumni to the Delphic Fraternity Wikipedia Page, thanks for the incredible research conducted by our Brother Eric Guzman. Dr. R. Paul Higgins, Sr. was a prominent physican and higher education officer from Cortland, NY. He was a member of the Young Men's Debating Club, which later became the Epsilon chapter of the Delphic Fraternity. Higgins Hall on the campus of SUNY Cortland is named after Dr. Higgins. A special shout out to the Cortland County Historical Soceity for the wonderful information on Dr. R. Paul Higgins, Sr. and for the copy of his historic photo.